Announcement! My friend Jen won these Siwy pants for me on Instagram! How cool is that? IG contests are a new favorite. They are so simple compared to blog giveaways! She literally just tagged me in the photo and we both got a pair. Can’t wait to rock them together! Haven’t had a twin day since about 1997. Come on, you all know what I’m talking about. You call up your BFF Jane the night before school to inform her to wear “a white tank top with overalls and white sneakers” baha. There are a couple fun elements to these pants besides the obvious delightful stretchy fit. The directional zipper and coated paneling gives a nice slimming effect for the hip department. Normally I’m not a big pocket detail kind of gal. But I like how settle these ones are. You really don’t notice at first. Those are the types of details I appreciate in pants. There is also something fabulous about this fur stole. I can’t even tell the amount of compliments I received from this piece. I’m not bragging for the sake of bragging because normally I just foofoo compliments. In my mind I’m like “oh they don’t mean it”, “they’re just being nice.” But no, here’s case and point. I wore this piece on new years because we spent it outdoors at a concert. Here’s the story: I’m leaving the spot with my boyfriend while grabbing our bikes to ride home we bump into my cousin and chat for a second. Then enters third male wearing salmon colored button up. We don’t know him, but he tries to strike up some flirty conversation about how he has a bike too and really likes mine. I go “oh what type do you have?” (if you actually own a bike chances are you’ve looked down at the emblem before) but no salmon shirt does not remember. Which tells me this guy is trying to holler. So he gets my cousin and boyfriend chatting for a second and then goes “so now that it’s just us talking I was wondering if you are here with either of these guys?” I’m like “ya that’s my boyfriend and cousin.” Good try though. Then he gives a couple quick “congratulations” my boyfriend and leaves. What is this congradulations business guys do? I’m standing right here. I can here you. I’m not a trophy. How about a congratulations to me for landing this dude? Needless to say, it’s been 5 years with my dude. I’d like to extend a congratulations to us both for sticking it out for the long haul. I used to die when girls would say I’m so lucky blah blah. But I get it now. Finding something true and pure is rare and should be celebrated. So cheers to long lasting thriving relationships! 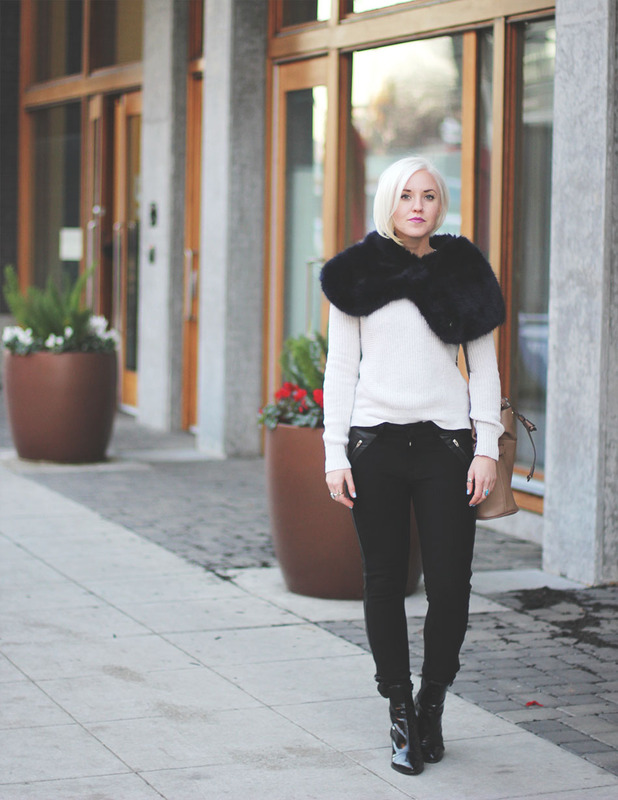 I love the fur stole! I’m slowly trying to get myself into instagram giveaways. If free pants as cool as that are involved, count me in! those pants are awesome!! what a fun giveaway!